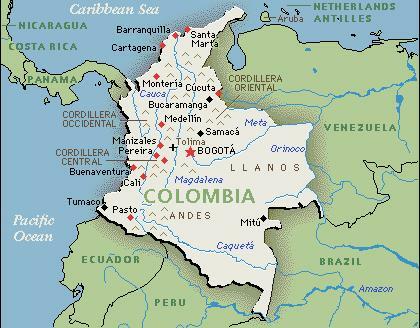 Colombia has an area of 440,831 sq. miles (1,141,748 sq km). The most distinguishing topographical feature is the Andes mountain chain. It extends from the north-west corner of the country all the way through the bottom. Colombia's highest point, Pico Cristóbal Colón, is 18,947 feet above sea level and is part of a isolated mountain mass called Sierra Nevada de Santa Marta. The principal river of Colombia is the Magdalena, which flows north in between the Cordillera Oriental and the Cordillera Central and empties into the Caribbean. The largest city and capital, Bogotá, lies in a valley at source of the Meta river. It's in valley which keeps much of the pollution in.